Back when I was a wee traveler, just out of college and ready to start my grown up career, I moved to the north shore of Lake Tahoe. I was adamant that I wanted to live west of the Mississippi - someplace with more interesting geography than central Illinois. I lived in Tahoe for two years - enjoying the sunsets over the lake from work and road tripping all over California. I lived where other people vacationed. This summer I finally went back. 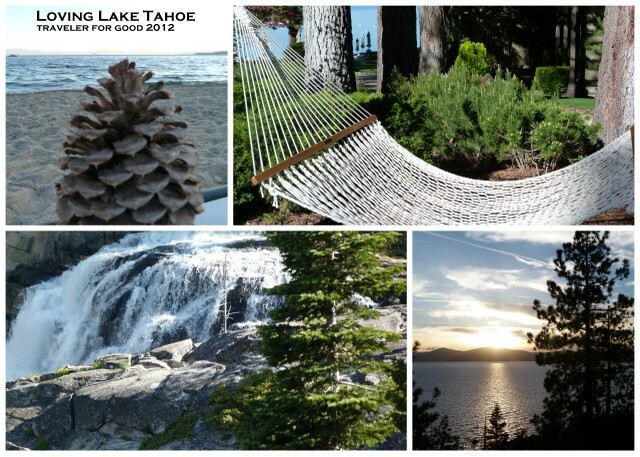 Lake Tahoe is one of the most beautiful places in the world. Why it took me ten years to return, I don't know. I didn't have an agenda, just enjoying the scenery and some of my favorite restaurants (Jake's on the Lake and Lone Eagle Grille) and activities (a drive around the lake and a sail on the Sierra Cloud). I slept in. I loafed by the pool, the lake and in the hammocks. I caught the sunsets. Roasted s'mores by the fire pit. Who says you can't go back again?